Q: I have a question about the 31 Chinese detained in Zambia for illegal mining. Do you have any updates since yesterday? A: Recently, 31 employees from Chinese-funded copper smelting enterprise have been indiscriminately arrested and detained by the police of the Cooperbelt Province of Zambia on the charge of illegal acquisition of copper tailings. 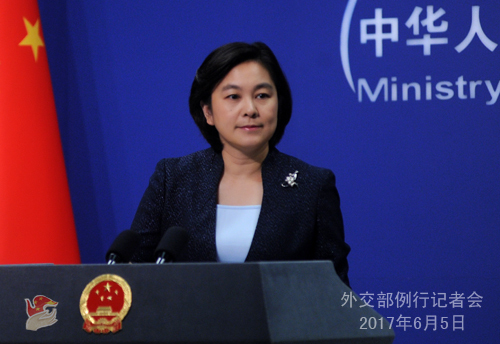 The Chinese Foreign Ministry pays great attention to this incident and has lodged solemn representations with the Zambian Embassy in China, urging the Zambian side to appropriately handle it in accordance with the law, release the innocents as soon as possible, and offer humanitarian treatment to those detained. The Chinese Embassy in Zambia has lodged representations immediately afterwards with the Zambian competent authorities, sent a task force to the scene of the incident, provided consular protection to the Chinese in detention and urged the Zambian side to improve the conditions for those detained. The Chinese government has always required the Chinese enterprises and personnel overseas to abide by local laws and regulations. We do not provide unprincipled protection for illegal behaviors, but we firmly oppose any selective law-enforcement action targeting overseas Chinese nationals. The Chinese side will closely follow the development of the case, urging and requesting Zambia to properly handle the case in accordance with the law as soon as possible. Q: Three attacks were reported in London on the night of June 3, among which two were identified as terrorist attack by the British police. What is your comment on that? Were there Chinese nationals injured or killed in the attacks? 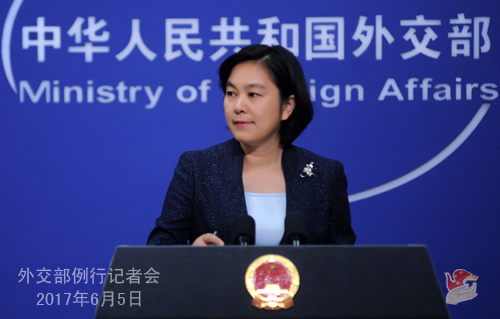 A: China strongly condemns the terrorist attacks that struck London once again, mourns deeply for the victims and expresses sincere sympathy with the injured and the bereaved families. The Chinese side has expressed its condolences to the UK through the diplomatic channel. Successive terrorist attacks in the UK highlight that the international community is faced with grave threat of terrorism. China firmly opposes all forms of terrorism and stands ready to work with other members of the international community, the UK included, to jointly crack down on terrorism and safeguard world peace and security. To date, there has been no report of death or injury of Chinese nationals. The Chinese Embassy in the UK has issued a consular alert. The Foreign Ministry and the Chinese diplomatic missions in the UK will continue to closely follow the development of the case, and we again remind Chinese nationals in the UK to pay close attention to the security situation and the local police notice and stay alert. Q: I wonder what is your response to reports today by the Australian media that the Chinese government backs Chinese students that harass, intimidate and threaten other students at Australian universities, and also that the Chinese government is operating a network of spies that threatens Australia’s national sovereignty. A: I understand you are working with the Australian Broadcasting Corporation where this report originated. I wonder how much credit you give to this report. What's told in the report is totally unfounded and irresponsible, and not worth refuting. I want to stress two points: first, China commits itself to conducting friendly exchanges and practical cooperation with Australia on the basis of mutual respect, equality and mutual benefit. The development of China-Australia relations has brought tangible benefits to the two peoples and served the common interests of the two sides; second, China urges the relevant Australian media to abide by the professional ethics of journalism, discard ideological bias and report on China’s development and China-Australia relations in an objective and fair manner. Your reports should encourage friendly exchanges, mutual understanding and trust, and greater cooperation between the two peoples instead of creating obstacles for China-Australia relations. Q: Egypt, Saudi Arabia, the UAE and Bahrain announced today their decision to sever diplomatic ties with Qatar after accusing it of backing terrorist group and meddling in their internal affairs. I would like to know China’s comment on this latest development in the Middle East. A: We have noted the relevant reports. China hopes that relevant countries can properly resolve differences through dialogue and consultation, uphold unity and jointly promote regional peace and stability. Q: Indian Prime Minister Modi said in Russia that despite existing border issue between China and India, not even a single bullet has been fired in the past 40 years. What is your comment on that? A: We have noted the positive remarks by Prime Minister Modi on China-India relations and welcome that. It is highly important for China and India to maintain sound and stable relations, as they are two major countries. Leaders of both countries attach great importance to the boundary question, on which they have in-depth communication during each meeting. Both agree that the early settlement of the boundary question serves the fundamental interests of both countries and is a strategic goal both sides strive to achieve. At the moment, China and India are exploring the solution through the mechanism of special representatives’ meeting on the boundary question while taking measures to uphold peace and tranquility in the border area. The Chinese side will work together with the Indian side to steer the course of the overall relationship, deepen cooperation across the board, strive for common growth and bring more benefits to the two countries and peoples. We believe that the steady and sound development of China-India relations will also benefit the region and beyond. Q: Premier Li Keqiang attended the 19th China-EU Summit last Friday. What is China’s comment on the results of the meeting? A: On June 2, Premier Li Keqiang, President of the European Council Donald Tusk and President of the European Commission Jean-Claude Junker co-chaired the 19th China-EU Summit at the headquarters of the European Council at Brussels. We have released the relevant information. The two sides had an exchange of in-depth views and reached many important consensuses on China-EU relations, trade and investment, cultural exchanges, global governance and pragmatic cooperation in other fields as well as international and regional issues of mutual concern. The two sides also held the China-EU Business Summit, China-EU SMEs Matchmaking Event and China-EU Dialogue on Innovation Cooperation and a series of supporting activities and meetings between departments. They also signed 10 cooperation documents on the China-EU Joint Investment Fund, intellectual property right, geographical indications, competitive policy dialogue, customs, scientific research, energy, the China-EU Blue Year and the China-EU Tourism Year. All these have demonstrated that this summit is successful and productive and indicated the comprehensive and in-depth development of China-EU cooperation. The leaders of the two sides applauded the positive outcomes of the summit, and commended the fruitful progress of China-EU relations in politics, economy, culture and other fields. Following the principles of mutual respect, equality, mutual trust and mutual benefit, the two sides will continue to enhance the partnerships for peace, growth, reform and civilization, and further expand bilateral, regional and global cooperation. 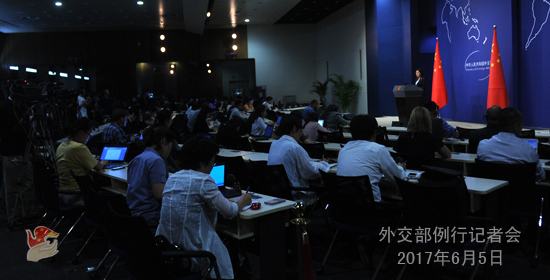 Q: Tomorrow the 8th Clean Energy ministerial meeting will be held in Beijing. As it is the first international meeting of its kind after the US pulled out of the Paris Agreement, what does China expect as a host country? A: I will refer you to the Ministry of Science and Technology for more details of the 8th Clean Energy ministerial meeting and the 2nd Mission Innovation ministerial meeting to be held by China from June 6 to 8. They have also released relevant information on that, and I can briefly introduce that. The meeting will be held under the theme of “tackling challenges through innovation, working together for a clean energy transition”, and consist of ministerial close-door meetings, high-level forums and other supporting activities such as exhibitions, innovation theater, side meetings and technical visits. We are expecting about 600 representatives at the meeting, including ministers from 26 members and one observer, heads of relevant international organizations, and world-renowned entrepreneurs. It is hoped that, through the meeting, relevant parties will strengthen cooperation on innovative clean energy technology, which is also conducive to global efforts on climate change. Q: Reports from India say that two PLA helicopters "violated" what was supposed to be India’s air space somewhere in the "Barahoti sector" of the China-India boundary. Do you have any comment on this? A: I suggest that you ask the military for details, but I can reply in principle. China and India have territorial disputes over the middle section of the boundary. The Chinese border troops conduct regular border patrols. China and India should communicate and coordinate with each other through relevant border-related mechanisms to jointly safeguard peace and tranquility of the border area. Q: US Secretary of State Rex Tillerson said in Australia today that we cannot allow China to use its economic power to buy its way out of other problems, such as the South China Sea, and the DPRK. Do you have any comment on this? A: We have noted the relevant reports. In the first place, I shall stress that the efforts of China and ASEAN countries to jointly uphold peace and stability in the South China Sea are there for all to see, and China’s enormous and relentless efforts to push for the peaceful settlement of the Korean Peninsula nuclear issue are also there for all to see. The US and Australia have recently made some remarks on the South China Sea, and China has clearly stated its position on that. I want to stress that the region has maintained a momentum of peaceful and stable development under the concerted efforts of all countries within the region, which is worth cherishing. The South China Sea issue has returned to the track of solution through negotiation and consultation by parties directly concerned. China and the Philippines have reached consensus on properly addressing the South China Sea issue and have just successfully held the first meeting of the bilateral consultation mechanism on the South China Sea issue. Meanwhile, China and ASEAN countries also reached a COC framework which lays a solid foundation for future consultation on the COC. China and ASEAN countries are also actively engaged in maritime practical cooperation and follow through on a series of early harvest projects. We hope relevant parties can fully respect and support regional countries’ efforts to safeguard peace and stability in the South China Sea and play a constructive role in this regard, rather than the opposite.